The Avaya IP500 Phone 2 Card (700431778) and Avaya IP500 Phone 8 Card (700417231) provide POT ports for analog telephones. The Office IP500 Phone Card is available in 2 versions giving 2 or 8 extensions. Telephones can be located up to 1 km from the unit using CAT5 cabling (see Handset Cable Lengths). Allows analog phones to connect to the unit by providing two extension ports. Fits with the trunk card of an IP Office 500 unit by using the RJ45 ports #'s 9-12. 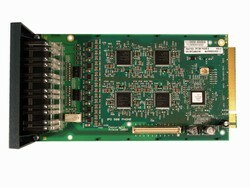 This trunk card allows network connection to 8 addtional analog phones through the 8 analog extension ports the card provides. These cards are compatible with the current IP500 Avaya IP Office system.